A recent NASA/ESA Hubble Space Telescope close-up image of part of NGC 7023, or the Iris Nebula, shows that the area is clogged with cosmic dust. 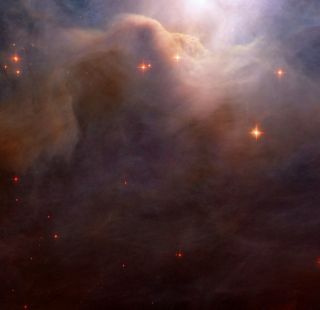 A recentimage taken by the Hubble Space Telescope reveals the perfect dust laboratoryin the sky and could help astronomers pin down the raw ingredients needed togive birth to baby stars. The stellarphoto is a composite of four images taken with different filters by Hubble's AdvancedCamera for Surveys. The resulting close-up shot reveals the northwest region ofthe Iris Nebula, or NGC 7023. The nebula is a region of star formation thatlies about 1,400 light-years away in the constellation of Cepheus. (A light-yearis the distance light will travel in a year, which is about 6 trillion miles,or 10 trillion km). The imageshows billowing mounds of cosmic dust. Such dust is made up of tiny particlesof solid matter ranging in size from 10 to 100 times smaller than the dustgrains you might find blanketing household furniture on terra firma. Thescientists were particularly interested in parts of the nebula that appearedredder than expected. Considered a reflection nebula, NGC 7023 scatters lightfrom a massive nearby star, which in this case is a star called HD 200775that's 10 times the mass of the sun. Typically, reflection nebulae appear blue,because dust grains scatter blue light more efficiently than red. ? (The othervariety of nebula, called emission nebulae, are hot enough to emit lightthemselves and tend to appear red.) ? Somehydrocarbon-based compound must be causing these dusty filaments to take on thered tinge, the researchers figure. In additionto studying the detailed Hubble image, the astronomers also used Hubble?s NearInfrared Camera and Multi-Object Spectrometer instrument to try to determine thechemical make-up of the nebula. In general,where there are clumps of dust, stars can sprout up as the material collapsesinward due to gravity. Over time if the clump gets massive enough, it ignites nuclearfusion, at which point a full-fledged star is born. And so the results couldalso add to knowledge of star birth.